I hope that you had as nice an Easter break as I did! It was nice to have time to spend with friends and family. This week, we will resume our work in language arts that was begun last week. Spelling and grammar can be found here. In our reading work, students are examining how to identify the steps in a process. In writing, our focus is on rewriting details from an article in our own words. In math, we are reviewing making equivalent fractions, writing fractions in simplest form, and identifying common factors and multiples. Our assessment for this chapter will be on Thursday. In social studies, students continue to make progress on their timeline projects for Tucson history. They will be working in groups to create a short video of their timeline to share. Demonstrative pronouns point our specific people, places, things, or ideas. For something that is near, use this (singular) or these (plural). For something that is far use that (singular) or those (plural). Fine Arts Night – ARF! 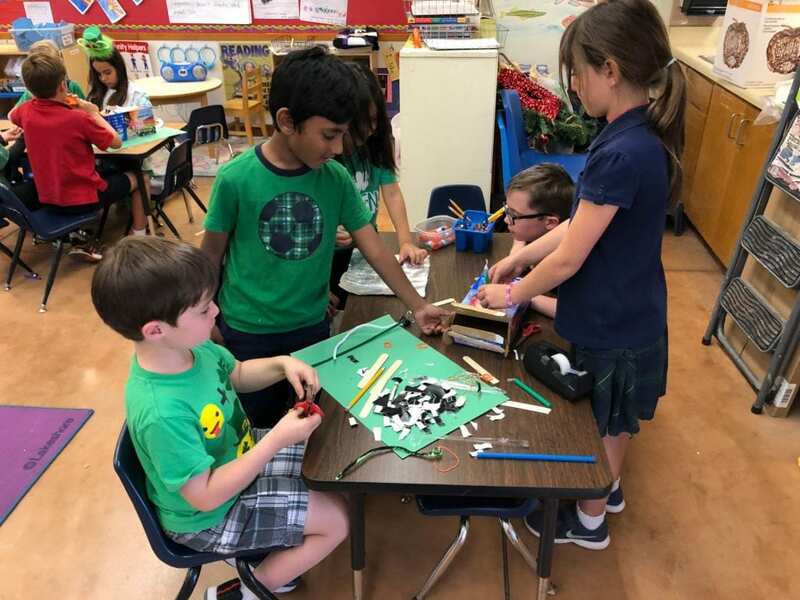 Our K-4 Fine Arts night is fast approaching this Friday, April 12. 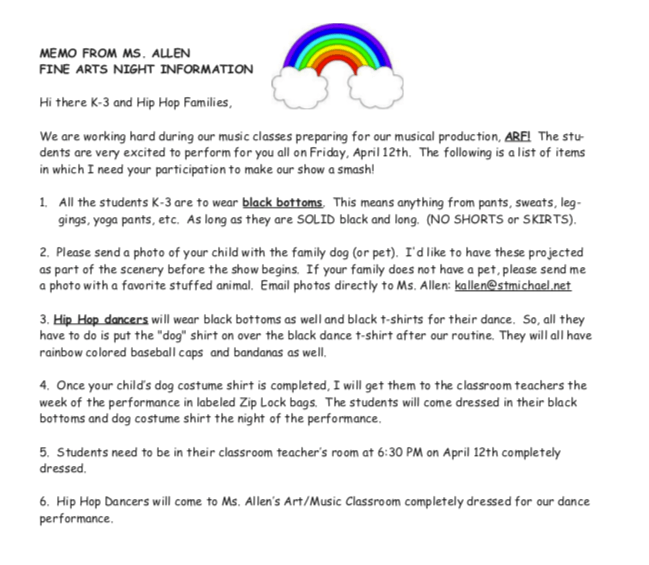 Please see the information from Ms. Allen below. Thanks – see you there! Writers use playful language such as idioms, and alliteration to make writing interesting. Readers should consider literal and non-literal language to help understand what is being said. For example: He is all ears means that he listens carefully, not that he is covered in ears. On Monday morning, we will be treated to a visit from guest author Jennifer Ward. Ms. Ward is the author of many great books for kids, both fiction and nonfiction. Some popular books of hers include Way Out in the Desert, There Was a Coyote Who Swallowed a Flea, and many more. You can check out her work at http://www.jenniferwardbooks.com/. We speak for wild birds and their homes. We create sustainable wild bird habitat. We help connect people with wild birds, supporting bird-focused education and outreach programs for all. We study and protect wild birds in their habitat. We believe in the power of birds to ignite discover and inspire passion. We study and reveal how nature works, fostering inquiry and education for children and adults. We bring together scientists, students and people from all walks of life to generate knowledge and conserve our shared, natural world. We advocate for protected open spaces, both on public and private lands. We work tirelessly to re-connect our threatened open space preserves. Along with continuing current projects, we’ll be shifting our sights to the Interstate 10-Davidson Canyon wildlife linkage area. A pronoun takes the place of or refers to a noun. We had a lot of fun on our field trip to Sweetwater Wetlands on Friday. The kids learned a lot about wetlands, water conservation, and protecting natural habitats. I hope to have some photos available soon! This week, we will be finishing our fifth language arts unit and will be taking unit assessments at the end of the week. For spelling, students will choose words to review from the unit 5 word lists: week 1, week 2, week 3, and week 4. In addition, we will find time to finish work on the fantasy book projects that students started last Friday. 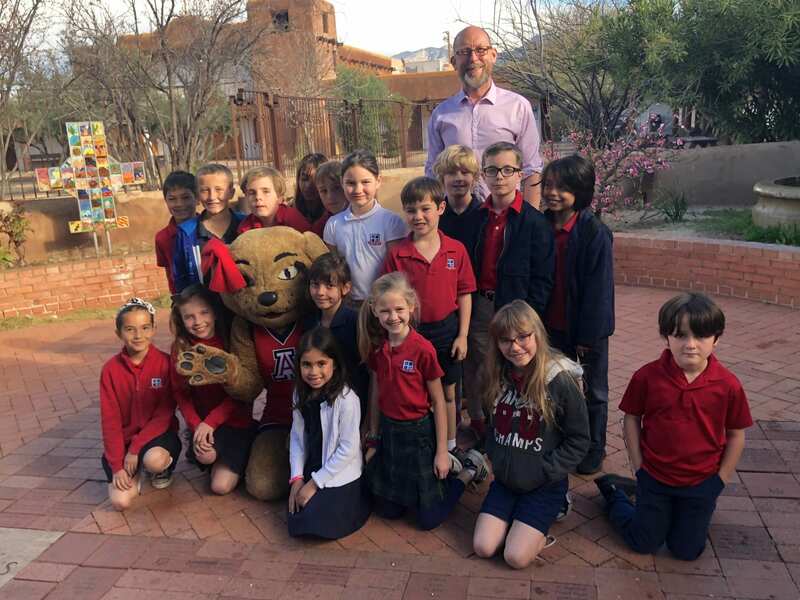 In Social Studies, we will begin working on our final Tucson history project. 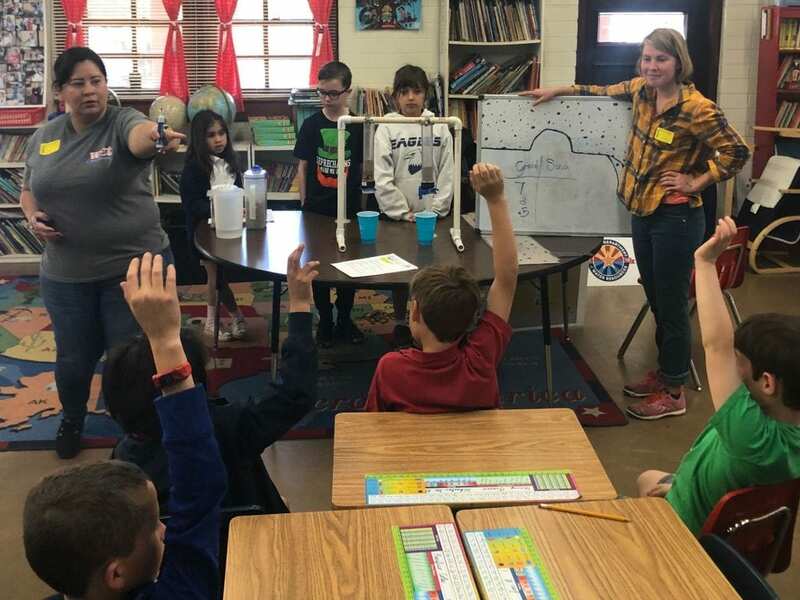 Students will work with a partner to select ten events that impacted the growth and development of Tucson over the years. They will create a timeline and presentation to explain what they’ve selected. In math, we will review our work from chapter 7 and will be starting chapter 8, exploring fractions. Students will learn about equivalent fractions, writing fractions in simplest form, and comparing fractions. We will be taking our class field trip to the Sweetwater Wetlands tomorrow, March 22. We will leave school around 8:15 and will return in time for lunch at school. In the afternoon, we will be working on our fantasy book report projects. If possible, students should bring their fantasy book to school. The project description was sent home previously. A copy is attached. We had a fun-filled, but busy time last week! 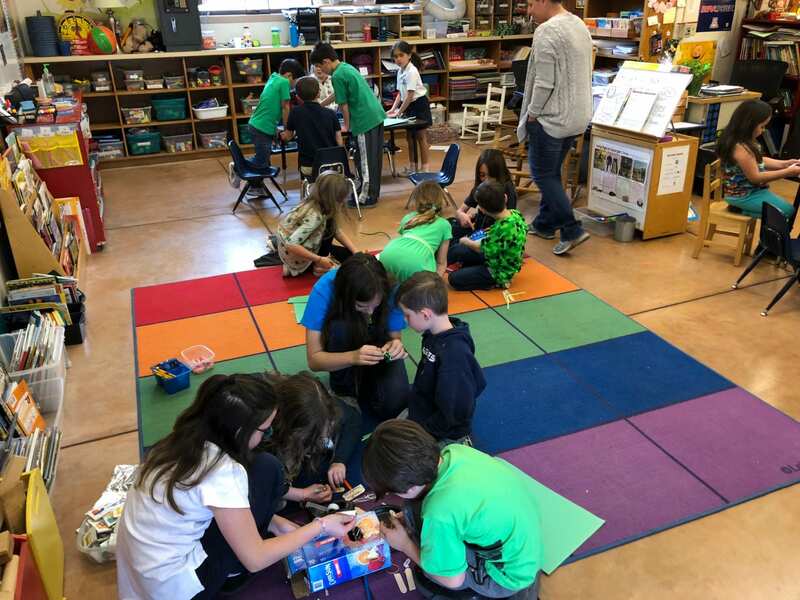 Starting with a visit from Wilma Wildcat for Monday Chapel and ending with cookie decorating, wetland environmental demonstrations, and leprechaun trap building with kindergarten on Friday, we packed a lot in! Here are a few pictures from our week. Thank you, also, to everyone for making time to come in for second trimester conferences. I enjoyed our conversations and am looking forward to the months ahead. As always, please continue to be in touch if questions arise. Finally, a huge thanks to everyone who helped make last week’s Love of Reading week so fun! We had a blast decorating our door in a pirate theme and really love all of the books that were donated from the book fair. Thank you! Thank you to people who have offered to drive. Students should be sure to wear close-toed shoes and sunscreen and/or a hat. We will be outdoors all morning. We will be back at school in time for lunch, though. 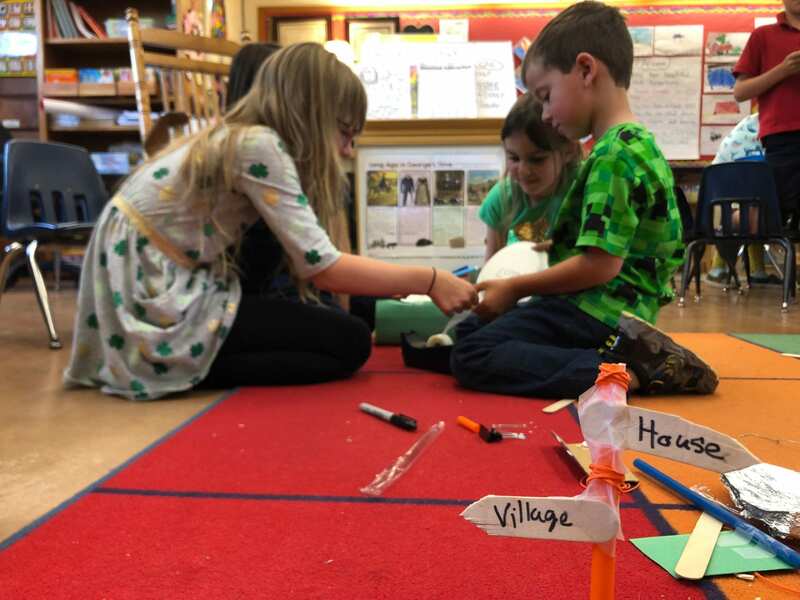 On Friday afternoon, students will be constructing a mobile that represents the fantasy book they read last month. They should bring in any materials that they think they will need. I’ll have some basic supplies available (colored paper, tape, markers). We are concluding our work in chapter 7 this week, examining sequences, patterns, and equations. Students are working on performing functions and solving expressions by following the order of operations. Our class will be helping during Tuesday morning’s mass. We haven’t assigned roles, so it will be first-come, first-choice on Tuesday morning! This week and next, we will be finishing our fifth unit: Mysteries of Matter. This week, students are examining what causes matter to change and will read science articles and short books on the topic. We will look at how the text features in nonfiction writing help us understand the writing better. Synonyms are words that have the same or almost the same meaning. You can use a synonym that you know to help you understand a new word in context. A possessive noun tells who or what owns something.